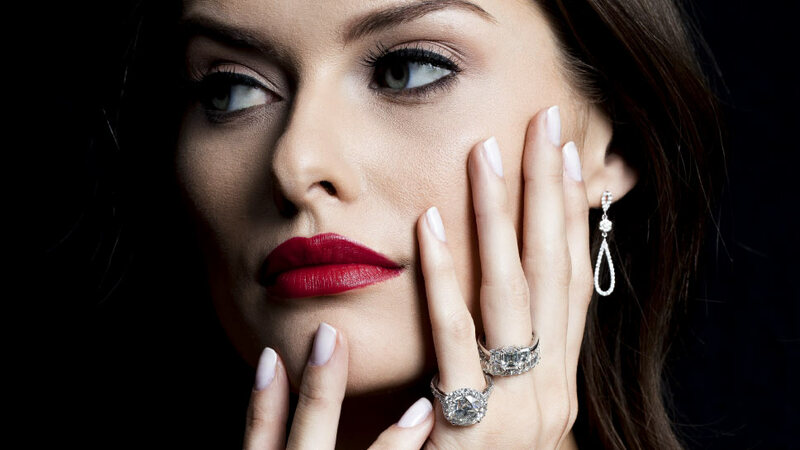 Our fall jewelry shoot celebrates the elegance, passion, and drama of timeless jewels just in time for holiday galas. OPPOSITE, From top: Diamond dangle earrings in 14k white gold; engagement ring with 2.01 carat emerald cut diamond, and .72 carat and .71 carat side emerald cut diamonds; emerald cut eternity band in 14k white gold with diamonds totaling 4.74 carats; halo-style diamond engagement ring in 18k white gold with 7.01 carat round brilliant cut diamond; pave diamond engagement ring in 18k white gold with a 4.10 carat pear shape diamond; princess cut eternity band in 14k white gold with diamonds totaling1.80 carats; engagement ring in 14k white gold with 2.08 carat round brilliant cut diamond and graduating round brilliant cut diamonds totaling 2.03 carats; diamond band in 14k white gold with graduating round brilliant cut diamonds totaling 2.41 carats; disc necklace in 14k white gold with pave diamonds totaling 1.91 carats; diamond collar in 18k white gold with 3-row bypass diamonds totaling 9.40 carats; tennis bracelet in 14k white gold with diamonds totaling 4 carats; tennis bracelet in 14k white gold with diamonds totaling 10.50 carats; bangle bracelet in 14k white gold with diamonds totaling .94 carats; pave bangle bracelet in 14k white gold with diamonds totaling 4.33 carats; pave bangle bracelet in 14k white gold with diamonds totaling 1.50 carats; antique Art Deco link bracelet in platinum with diamonds totaling 7 carats. Zabler Design Jewelers is located at 26 S. Prospect Avenue in Clarendon Hills, 630-323-6269, and in Door County, Wisconsin, zablerdesign.com. From top: Curved teardrop earring in 18k rose gold with diamonds totaling .14 carats, Made in Italy; wide band ring in 18k white and rose gold with diamonds totaling 1.71 carats, Made in Italy; wide band ring in 18k rose gold with bezel set diamonds totaling1.28 carats, Made in Italy; large link bangle in18k yellow gold with pave diamonds totaling 2.12 carats, Made in Belgium; large link hinged cuff in 18k yellow gold with diamonds totaling .40 carats, Made in Italy; large link hinged cuff in 18k yellow gold with diamonds totaling 1.42 carats, Made in Italy. Diamond necklaces by A Link, both in 18k white gold; long necklace has diamonds totaling 25 carats; stacked bracelets, all set in 18k gold, by Roberto Coin and Bez Ambar; rings by Bez Ambar and Forevermark. Browning & Sons is located at 46 S. Washington Street in Hinsdale, 630-986-0880, browningandsons.com.